Add a little edge to your wardrobe! It seems that the split tee trend has been popping up everywhere we look. 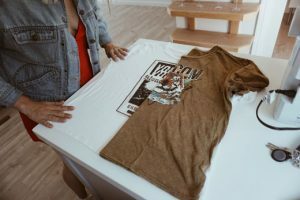 Inspired by our own Let’s Split Tee, we decided to get creative and make our own version! Our newest batch of incredible graphic tees made it easy for us to get started. 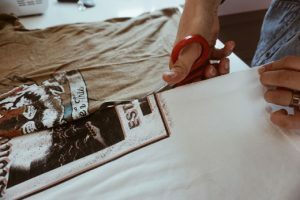 Read on to see how we made our own split tee so you can get started on yours! 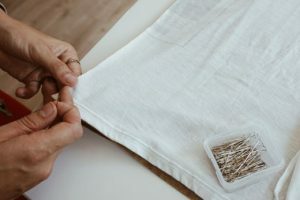 Fold each tee in half (long ways) and lay them side by side on a flat surface. Cut each tee in half. You’ll end up with four separate pieces. Grab the two pieces and lay them on top of each other (graphic to graphic). Match the collars and start pinning the pieces together until you reach the bottom. The needles keep the shirts in place. It should look like this! It’s time to start sewing! 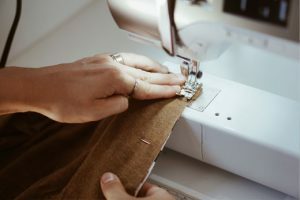 If you don’t own a sewing machine, you can also hand sew the pieces together. You’re almost there. Be proud of your creation. Now repeat steps 3 and 4 to finish the back of the shirt. All that’s left to do make a matching tee for your bestie and rock them together!